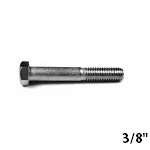 Stainless steel hex cap screws - also referred to as hex cap bolts - have a smooth body with threading on the end. 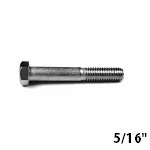 Thread length of cap screws is generally twice the diameter of the shank plus 1/4" for lengths up to 6" and twice the diameter plus 1/2" for lengths over 6". Some hex caps may have an additional 1/4" to 1/2" of threading depending on the manufacturer. Hex cap screws are normally installed with two flat washers and a hex nut.